Our Salsa does double duty as a marinade for the chicken and a dressing for the finished dish. Simply marinate the chicken in the salsa, grill and serve over greens with orange and avocado. Top with more salsa and you have a quick, easy and delicious dinner. Stir 2/3 cup salsa and the oil in a bowl. Pour the salsa mixture into a shallow, nonmetallic dish or gallon-size resealable plastic bag. Add the chicken and turn to coat. Cover the dish or seal the bag and refrigerate for 1 hour. Remove the chicken from the marinade and season as desired. Lightly oil the grill rack and heat the grill to medium. Grill the chicken for 10 minutes, brushing often with the marinade. Discard marinade. Continue grilling chicken for 5 minutes or until cooked through. Cut the chicken into thin slices. 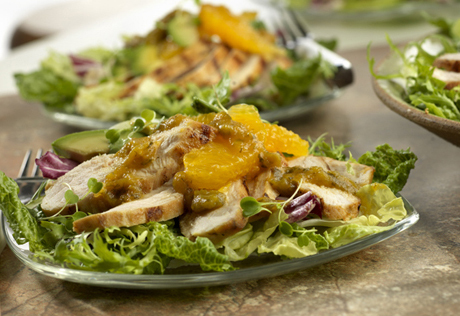 Arrange the chicken on the greens and top with the orange segments and avocado. Drizzle with the remaining salsa verde. Serve with the lime wedges, if desired.